Project obstacles and solutions: In June 2014, ConAgra Foods broke ground on a 1.6 million square foot dry foods distribution center in Frankfort, Indiana. When completed, the facility will have 40 acres under roof. The building includes 125 docking stations and 10 doors customized for rail service. Opus Group was contracted to do the development work and serve as the general contractor. Shiel Sexton did the concrete footings and floors. Due to the volume of concrete needed, IMI set up a portable plant at their Frankfort location. Having two operational batching plants allowed IMI to provide up to 2,100 yards of concrete per day with 20 mixer trucks. The concrete for the floors was a blended aggregate mix that was designed specifically for large warehouse floors. The aggregates were selected to prevent curling as the concrete cured. Any project of this size is tied closely to its schedule. To accommodate this, the first floors were poured in an open-air environment before the steel rafters and roof were set in place. Pouring a concrete slab intended for indoor usage without a covering is a bit tricky. IMI QC/QA monitored weather and mix designs to make sure the concrete was workable for the finishers. 10,000 yards of the 42,000 yards in the floors were placed in an open-air setting. 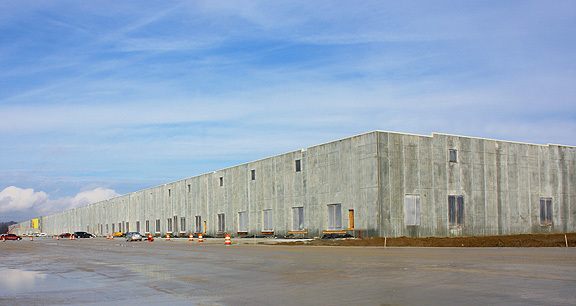 In 2016, this project was awarded an Outstanding Concrete Achievement Award from the Indiana Ready Mix Concrete Association for a distribution center.